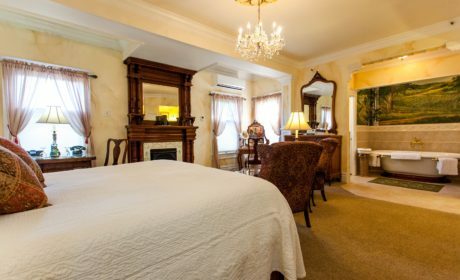 Come and discover the old-world craftsmanship and elegance of an 1890 mansion at the Churchill Manor’s luxurious downtown Napa accommodations. Enter your room at our Napa Valley lodging through beautiful hand painted doors and be ready to experience a true unique place to stay in downtown Napa. 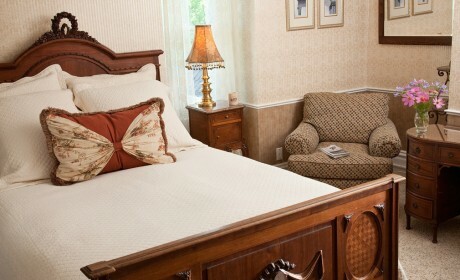 The rooms at Churchill Manor feature modern amenities to offer the ultimate in guest comfort. Each room is named after a Napa Valley wine growing regions, called “Appellations”, which have been painted on each door by a local Napa artist. 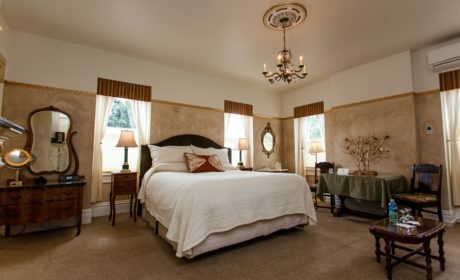 Expect to be pampered in our downtown Napa accommodations through our exceptional customer service and superior rooms, furnished with the opulence of the following Napa Valley amenities. 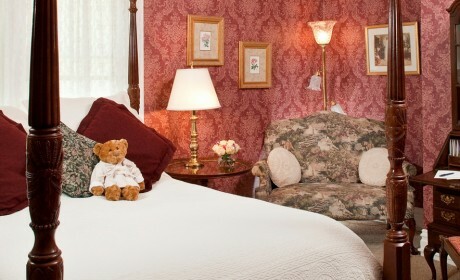 Churchill Manor features 10 beautifully appointed guest rooms, many accommodating 2-3 guests. 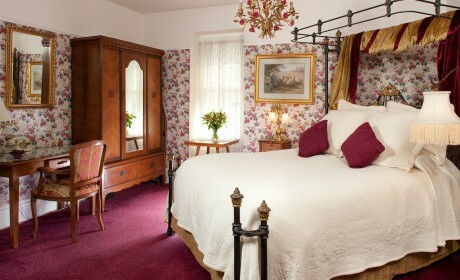 Our bed and breakfast is the perfect destination for couples looking for romantic places to stay in Napa Valley. 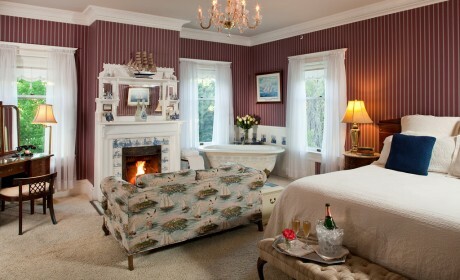 Many of our rooms feature a 2-person soaking tub, cozy fireplaces, king size beds, as well as luxury robes and linens. Brows our complete list of downtown Napa accommodations below. We look forward to having you and helping you plan the ultimate Napa Valley getaway. 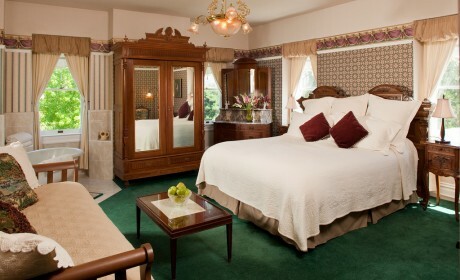 Expect to be pampered at our Napa Valley lodging through our exceptional customer service and superior rooms, furnished with the opulence of the following Napa Valley amenities. 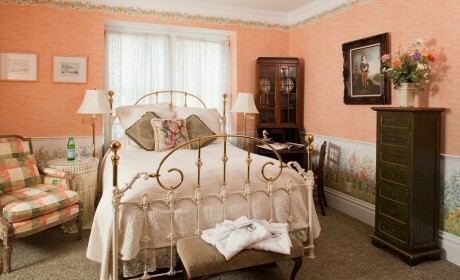 Carneros is a queen room on the first floor featuring a bay window that overlooks the beautiful garden. 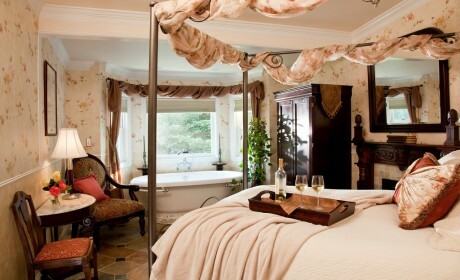 Mount Veeder is a second floor location featuring a beautiful carved wood queen four-poster bed. 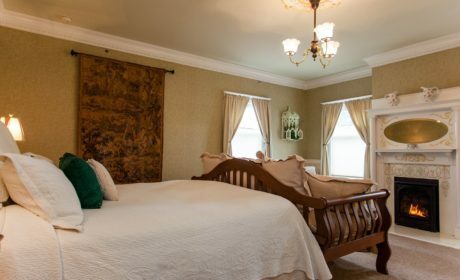 Spring Mountain is a third floor room featuring an ornate queen brass bed, an gas fireplace, and a bathroom with a large tiled shower and antique 1-person claw-foot soaking tub.